maN ulagOr thAm aRiya – for the people in this world to know. Then, he (maNavALa mAmunigaL) says that I shall divine the months and star days of incarnation of these AzhvArs and AchAryas, for everyone to know. anthamizhAl naRkalaigaL Ayndhu uraiththa AzhvArgaL – Unlike vEdham which is in the form of samskrutham, which has got eligibility criteria to recite it, with having difficulty in trying to figure out the meanings of karma kANtam and brahma kANtam, prabandham is having the greatness of being of pure/simple thamizh, it is being easy for everyone, and is in the enjoyable thamizh language – that is the language in which they (AzhvArs) have divined it (prabandhams) after having researched and understood the vEdhas well, like said in ‘paNNiya thamizh [thiruvAimozhi 2.7.13] (~ created in thamizh)’. 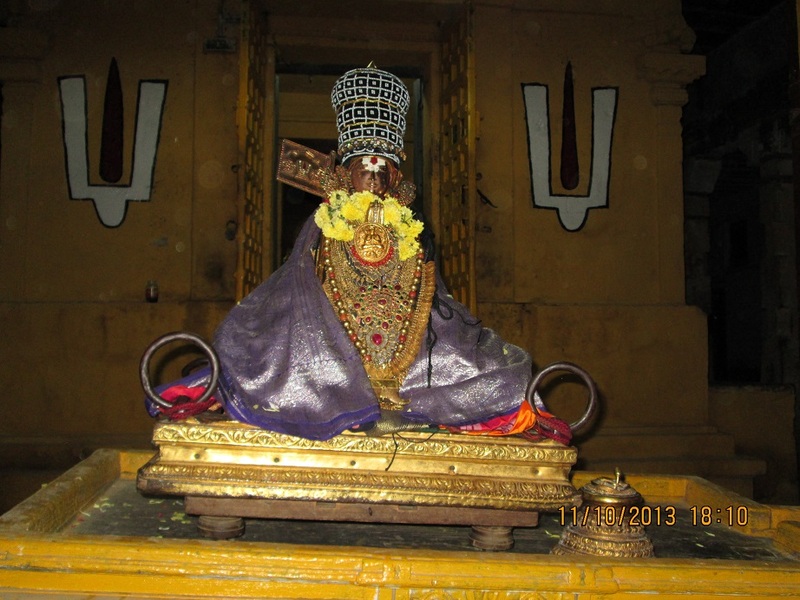 naRkalai is – the unblemished vEdham that is the reference. AzhvArs researched/thought through and divined its meanings in thamizh. So this is ‘thirumAlavan kavi [thiruviruththam – 48]’, that is, would talk only about the almighty who is the husband of srIdhEvi. As said in ‘pin ivvulaginil pEr iruL [periyAzhvAr thirumozhi 1.8.10]’, this world is material as the meaning of the word ‘thamas’. So we in this world take up the dirty body that hides us from emperumAn’s nature, and as said in ‘aRivilA manisar [thirumAlai – 13]’, we are without true knowledge; clarity in knowledge is required for us only. Only those caught in darkness would need the light of sun, etc. So he is saying in this pAsuram, ‘indha ulagil iruL neenga vandhu udhiththa’. For removing the darkness of this world, don’t we need these kinds of suns: ‘vandhE parAnkusAdhithyam [AzhvAr mukthakam]’ (salute to the sun that is nammAzhvAr), and ‘kalayAmi kalidhvamsam kavimlOka dhivAkaram [periya thirumozhi thaniyan]’ (being one who removes the problems of kali yuga, being one who is a sun for the world, I meditate on such thirumangai AzhvAr), and ‘rAmAnuja dhivAkara: [varavaramuni mukthakam – 6] (sun that is rAmAnujar); from their rising is how the darkness of ignorance was destroyed, and ‘thamas’ based illiteracy was destroyed, birth of reduction of sins (pApa dhvAntha kshayam): only in the presence of such vishNu devotees would the darkness that is spread everywhere would leave. This implicitly applies to other AzhvArs as well. vandhu udhiththa mAdhangaL, nALgaL thammai, maNNulagOr thAm aRiya eedhenRu solluvOm yAm – that is, like the the twelve ways suns each are in the month of chiththirai (ChithrA), etc. In the same way, AzhvArs too incarnated in respective order, starting from the month of aippasi (asvina). 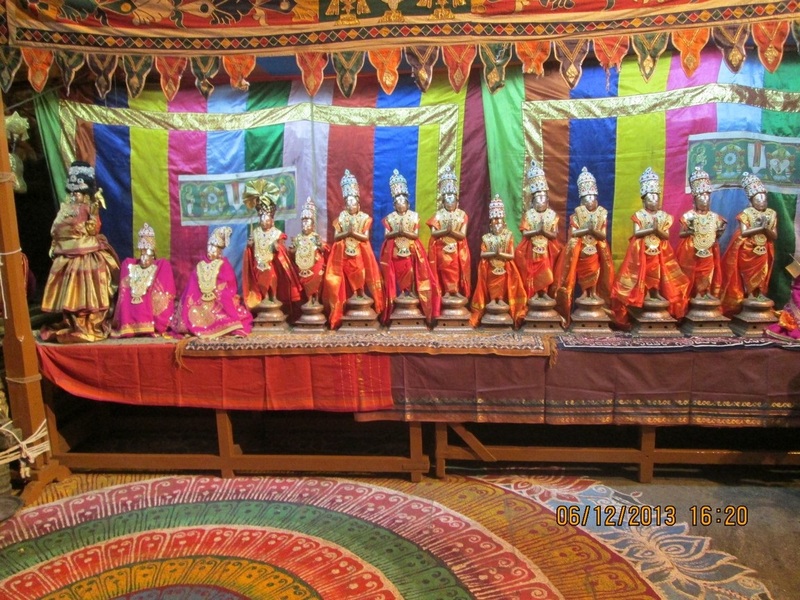 ‘vandhu udhiththa’ shows that they came from paramapadham and rose in this world. Days are to be said as ‘aththaththin paththA nAL [periyAzhvAr thirumozhi 1.2.6]’, and ‘thirunAL thiruvONam [periyAzhvAr thirumozhi 2.3.9]’ (for emperumAn’s star day of incarnation). Here too it is starting from thiruvONam (sravaNa) till kEttai (jyEshta) the ten star days in between. Only by learning about these that can create auspiciousness would one get the goal. It is said, ‘janmarkshE shravaNEpivA [dharma sAsthram]’ (in the start of birth and in thiruvONam (sravaNa). Since their incarnation is special related to emperumAn, similar to rOhiNi, punarpUsam (punarvasu), etc., their star days of incarnation are also for celebration and nurturing. maNNulagOr thAm aRiya – Like said in ‘agal gyAlaththu avar aRiya [thiruvAimozhi 4.8.6]’, there is no need to advise/educate those in the other world; as said in ‘maNNil piRandhu … angu eNNam onRinRi irukkum Ezhai manisarkAL [periyAzhvAr thirumozhi 4.6.7]’ (~ Oh poor people, being born in this earth, and not having any thoughts about that world) – for people of this world only there is a need to advise/educate. maNNulagOr thAm aRiya – To those born in this earth, the devotees who do not have the true knowledge – for them to know (about the months and start days of AzhvArs‘ incarnations) and celebrate, and who are not trying to know that this is the way to reach the goal, let me, who is very interested in it. shall explain to them without their requesting for the details – is how maNavALa mAmunigaL’s oath is. From this, it is shown that AchAryan’s ways is to teach us what we do not know. This entry was posted in Other, upadhESa raththina mAlai and tagged 74, annan, erumbi, erumbiappa, kovil, madhangal, mamunigal, manavala, nalgal, pasurams, rathina, rathinamalai, raththina, raththinamalai, upadesa, upadhesa on December 6, 2015 by raghuram.